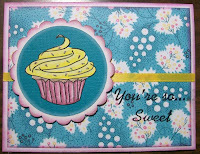 Okieladybug's Scrap N' More: Cupcake Cards, Christmas card.....and even an ugly card! 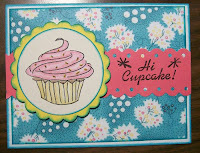 Cupcake Cards, Christmas card.....and even an ugly card! Well I got my Prisma pencils from Plumeriastix yesterday so today I had to try them! I did 3 cupcake cards. The two with the blue mat paper are from a challenge that LGuild gave me. She brought me some "ugly paper" as she called it and told me "it's a challenge to see what you can do with it" LOL. 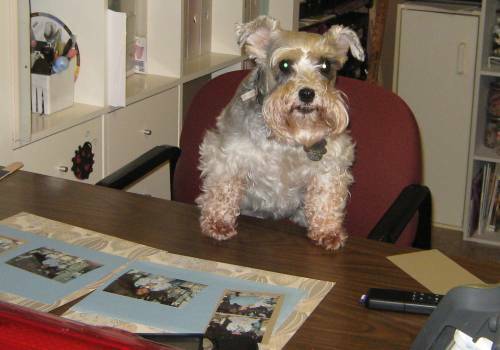 I still have some more sheets she brought me that I need to do something with. 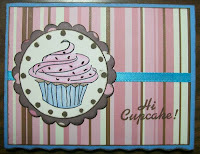 The cupcake stamp is a Inkadinkadoo set. The scalloped circle are some that I made on DS. Next I did a Christmas card as part of a Christmas in July Challenge on the Cricut MB. I saw a Suspension card on Splitcoaststampers and thought I would give it a shot. Since I don't have circle punches I just made my pattern on DS. I used the cuttlebug embossing folder snowflake and Paisley, which I received yesterday from MelissaMissesTX! THANK YOU SO MUCH! The card base is barn red card stock I got at Big Lots, I don't know the name brand. I inked with white Colorbox Cat Eye ink. The large mat is a paisley sheet from My Mind's Eye Magnolia pack. The middle mats are DCWV pink, sanded and inked with Color box cat eye ink, fuschia. I used DCWV light blue card stock and sanded after embossing with the snowflake folder for the small mats and inked with Color box cat eye ink terracotta. I used Christmas Cheer for the snowman. I cuttle bugged his scarf with the Paisley folder and used black scribblers for his eyes, mouth and buttons and orange for his carrot nose. I also inked around the bottom of the snowman with Colorbox Cat Eye ink gray. 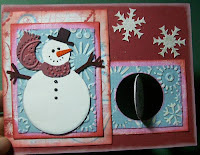 The sentiment stamp is a Studio G and the snowflake stamp is from the Inkadinkadoo Warm Wishes holiday set. The snowflakes are a Paper Studio punch and I used a glitter pen on them. For suspending the circle I used dental floss. Lastly I did a black and white card, which I am just not loving!! 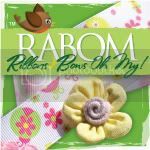 I wanted to try out the ribbon and stickers that I won on DCscrappers blog. But I just did not do the ribbon and stickers justice! *tear rolls down okie's cheek*. I will try better next time Lillie! I PROMISE! 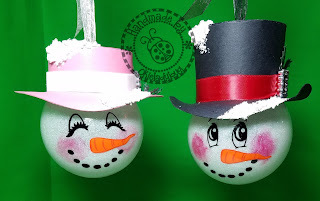 You should enter your snowman card in my Christmas in July contest on my blog. I think the black & white card looks great! I think the B&W card looks very classy!